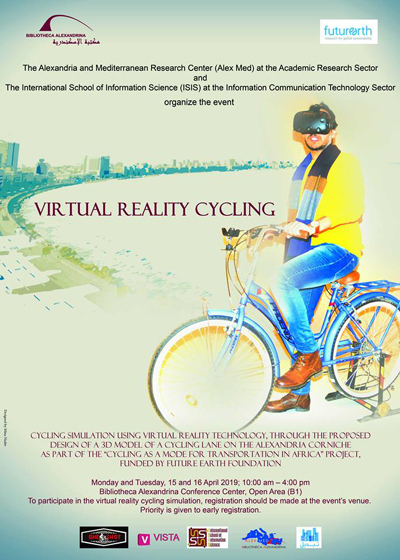 The Alexandria and Mediterranean Research Centre (Alex Med) and the International School of Information Science (ISIS) are organising a cycling simulation using virtual reality technology to create a 3D model of a proposed cycling lane on the Alexandria Corniche. The simulation is part of the “Cycling as a Mode for Transportation in Africa” project, funded by the Future Earth Foundation. The event will take place 15-16 April, 10am to 4pm. The meeting point is the Bibliotheca Alexandrina Conference Centre, B1 Open Area. 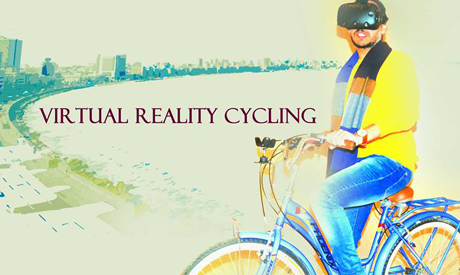 In the event, participants will use a fixed bike and wear special VR technology equipment which will allow them to experience firsthand a true sense of cycling in a 3D lane designed for the Alexandria Corniche. The event is open to the public. Registration will be at the event venue. The “Cycling as a Mode for Transportation in Africa” project aims at encouraging cycling instead of driving as a sustainable mode of transport. Within the efforts of the project, a workshop was held in September and resulted in a proposal of creating cycling lanes in Alexandria. The proposal was presented publicly along with designs in Alexandria and was received positively.